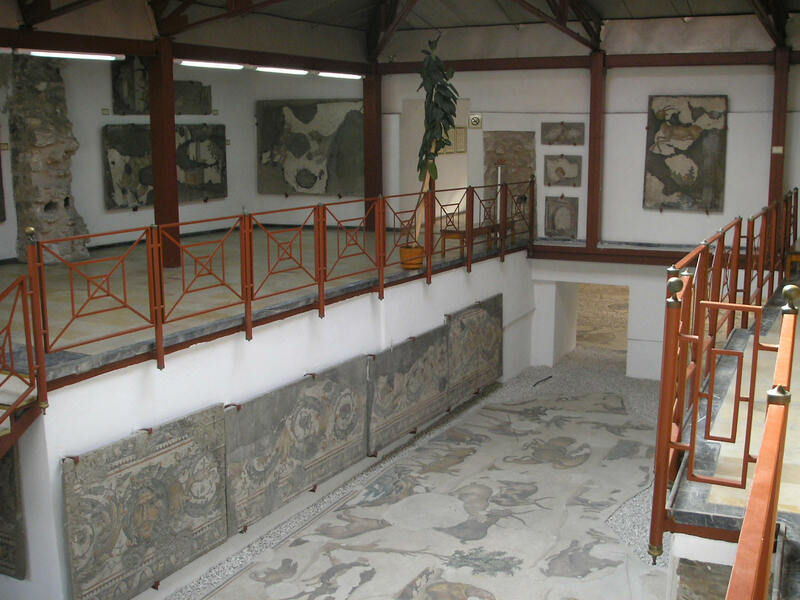 The Great Palace Mosaic Museum (Turkish: Büyük Saray Mozaikleri Müzesi, Istanbul Mosaic Museum), is located close to Sultanahmet Square in Istanbul, Turkey, at Arasta Bazaar. 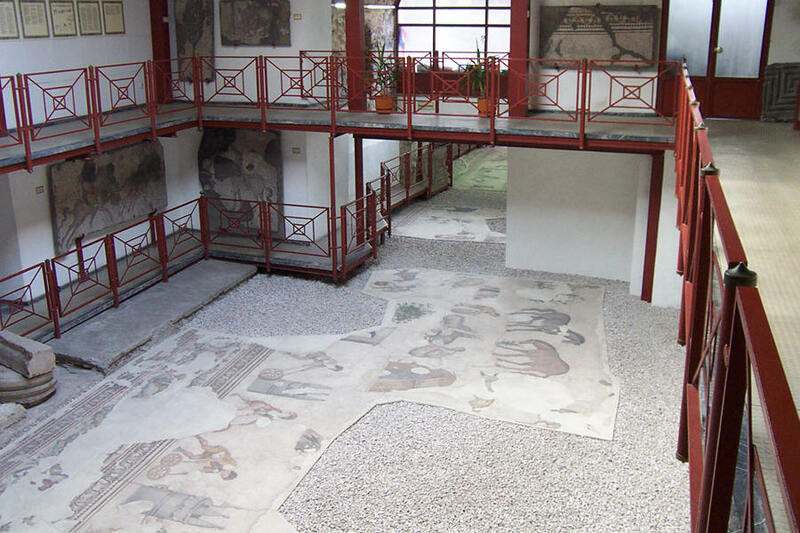 The Istanbul Mosaic Museum houses floor mosaics of the late Roman and early Byzantine period, and wall ornaments of the Great Palace of Constantinople(Istanbul). Floor mosaic of a child and a donkey (c. 5th century)It is believed that the Great Palace of Constantinople was constructed during the reign of Justinian I (527-565). The Great Palace mosaic was the largest and the most beautiful landscape in antiquity (6th century A.D). Nowhere in the world of late antiquity can we find a building with a tessellated pavement of similar size and perfection of workmanship. It was probably made by an imperial workshop that must surely have employed the best craftsmen gathered from all corners of the Byzantine Empire, guided by a master artist. It is this circumstance which makes it difficult to compare the piece with creations, and thus to date it by means of typological and stylistic methods. Composing the tessellated pavement, with its many coloured lime, terracotta and glass cubes of 5 mm. One square metre of floor space consumed about 40.000 cubes, which makes for 80.000.000 tesserae for entire area. 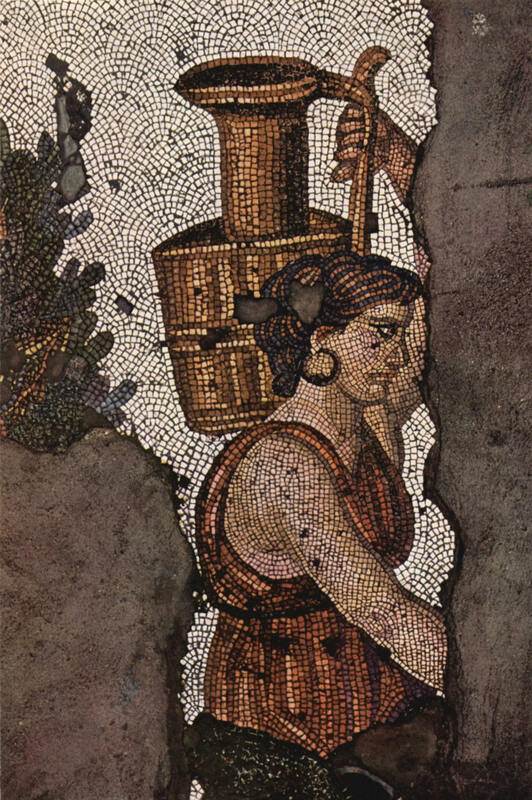 The mosaic was brought to light only in fragment and sections, which together make-up about one seventy the original expanse, but these suffice to show that it is one of the most magnificent compositions known to us from antique mosaic art. 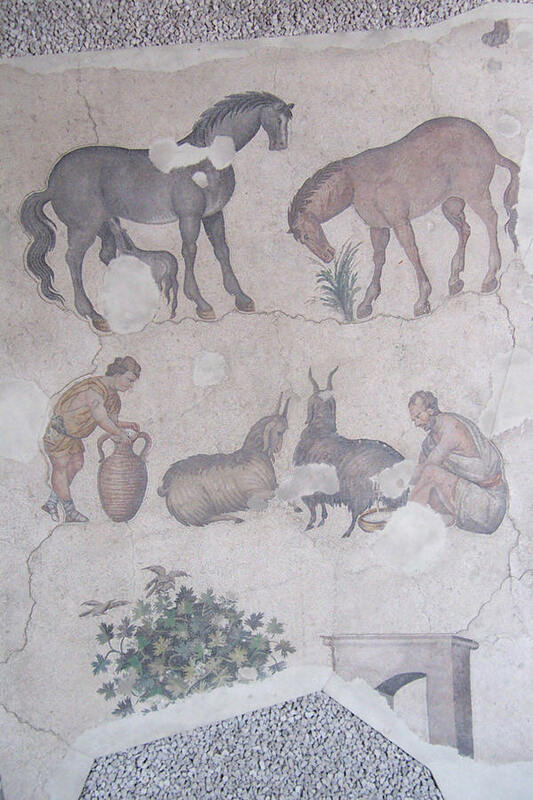 In the Great Palace Mosaic, the main field of the composition was 6 metres in width. On either side of its edge it is accompanied by an exquisitely arranged border of foliage each 1.50 metres wide, sufficient to cover the entire hall depth of 9 metres with a tessellated pavement. The frame is dominated by a highly naturalistic acanthus scroll. Acanthus are filled with masked heads, exotic fruit and animals. The frame symbolises the Garden of Eden. After frame when looking at the scenes we find a movement from left to right in the north-eastern hall. The pictures describe open-air scenes, the life of herdsmen the labour of peasants and the prowess of huntsmen. Scenes of children playing of wild beast and grazing animals alternate with mythological motifs animal fables and fabulous creatures from exotic countries, animals, hunting, games, bucolic scenes nature and myths are the leading themes in the succession of pictures. 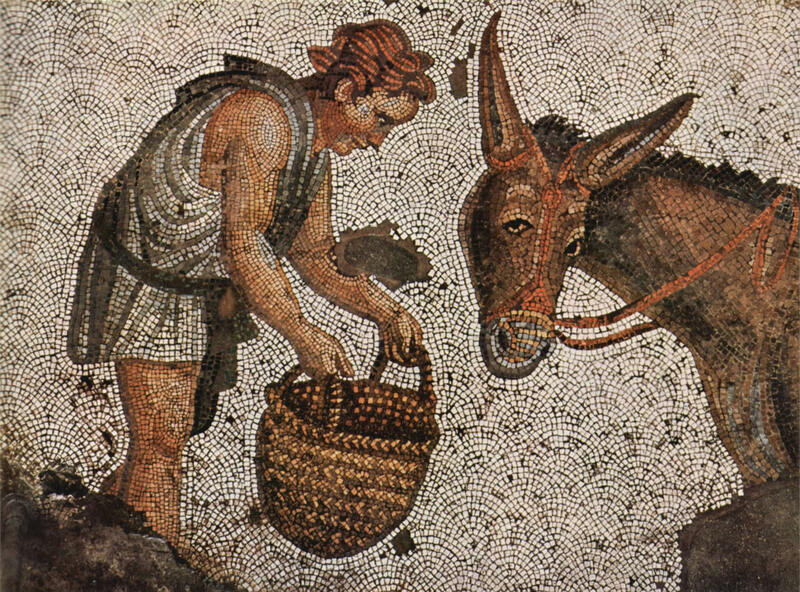 On surviving parts of the mosaic we still count 90 different themes populated by some 150 human and animal figures. The palatial district extended from Hagia Sophia and the Hippodrome to the coast line, where the sea wall acted as a mighty boundary of great military value. Its basic layout, first determined by Emperor Constantine I, soon housed a collection of state buildings with courtyards, throne rooms and audience rooms, churches and chapels gardens and fountains, libraries, assembly buildings, thermal baths and stadiums. Throughout the centuries palaces decayed due to fires, earthquakes, and other reasons. Finally, whatever remained was covered by earth. British scientists from the University of St Andrews in Scotland made extensive excavations at the Arasta Bazaar in Sultan Ahmet Square (1935-1938) and (1951-1954), which partly opened up one of the south-western buildings, so called "Great Palace." The Great Palace had a large courtyard with perisyle (1872 m²) and was decorated with mosaics. 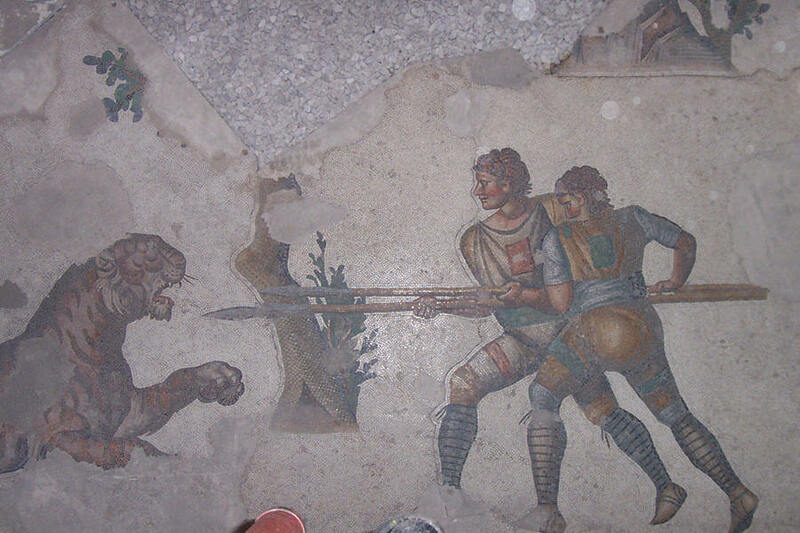 It was at this point that the Austrian Academy of Sciences undertook to rescue, supervised by Prof. Dr. Werner Jobst, to study and preserve the famous palace mosaic and to carry out additional archaeological examinations (1983-1997) within the scope of a cooperative project with the Directorate General of Monuments and Museums in Turkey.